One might very well be surprised to see the illustrious Leonard Bailey, of Boston, Massachusetts, included in this section, but ol' Leonard had to go through a few iterations on his bench plane design before he perfected it into the design we know and love today. Thus, some of his efforts went awry and can be properly labelled as deadends. However, his deadends are the passion of many tool collectors as it's these planes that command a real premium in the old tool dog n' pony shows. Those of us who slavishly follow the popular and informative type study of Stanley's bench planes can sometimes be puzzled when confronted with something that doesn't quite fit within the rigid confines of the guide. When faced with something that can be Type 8c, Section 4, paragraph 13, or possibly Type 9q, ibid, we're often left scratching the pate in bewilderment. What possible type, then, can this #3-sized smoother be? If you look closely, right below that funky adjusting nut, you can see a screw sticking up from the bed, directly behind the frog, on which it makes contact via a clip-like projection at the rear of the frog's casting. Is this some amphibious vestige, the result of a tadpole's congenital deformity? Was Bailey affraid that two screws couldn't keep the frog from hopping up and thought a third one necessary to keep it put? Your guess is as good as anybody's, here. However, one thing's for certain, the screw does absolutely nothing other than making it a pain in the arse to adjust the frog. It's a wonder that any of these planes survived (and you can count those that did on one or two hands, they are that rare) with the third screw in place. 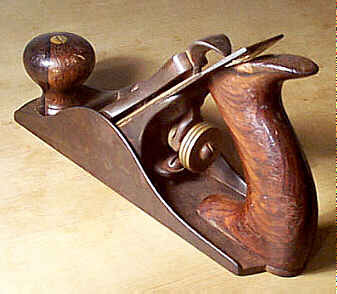 This, then, is the true Type 1 of the conventional Bailey bench plane design. Perhaps it's best to designate this one as Type 0 (zero), as that's surely what Bailey would have received, the big goose egg, were he made to take the Sound Plane Design Test that all aspiring planemakers had to pass. It's comforting to know that even the mighty Leonard Bailey dicked up. With that in mind, there's hope for us all. 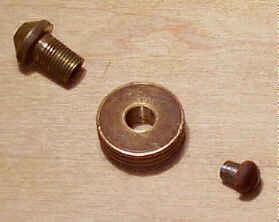 But, there is a worthwhile feature that bears mentioning about this plane, and that's its brass adjusting nut. You might notice that there is a round headed screw sticking out from it. Well, maybe not, but that's what it is. This screw keeps the adjusting nut from falling apart. What's that you say? The adjusting nut is actually made up of three parts, the knurled outer part (largest diameter), a smaller nozzle-shaped inner part that screws into the outer part, and the screw. What might first appear to be a rather stupid idea is actually very clever, albeit very costly to manufacture, which led to its short-lived existence. The 'groove' in the adjusting nut can be custom sized by controlling the distance the inner part threads into the outer part, and then have it locked in place with the small round headed screw. Bailey likely designed this nut so that any slop in the adjusting fork could be taken out by custom setting the adjusting nut thereby removing any slop between the adjusting fork and its controlling nut. I take that back, Leonard, if you're listening. You were a genius. Really. You were.